Eamonn wanted to be in Josef K and modelled himself on Edwyn Collins, while the others wanted to be in The Smiths. Every rehearsal they would start playing The Smiths mid song to annoy the hell out of Eamonn. It was great fun!! A compilation of all of our records titled 'Long Ball Into Nowhere' has just been jointly released by Fire Station Records in Germany and Clarendon Records which is very exciting. It is very strange writing about a band sixteen years later but we didn't do much so it's not so hard to remember. Obviously the best part was going to London as teenagers to record our John Peel Session . Peter Hahndorf, Tweenet had always been a fan. We think it is due to the fact that he was in the BBC with John Peel on the night that he broadcast our session. Article here about it. It's a pity we never got to record an album, but back in the 80's no one had any money. Ireland was a bleak place and the celtic tiger had not kicked in. 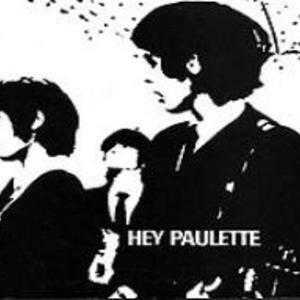 Hey Paulette recorded our first single 'Commonplace' in our late teens with a drum machine for the label Mickey Rourke's fridge run by enigmatic Sean A Mc Dermott. We topped the alternative top ten on Capital Radio with this single in 1988. We eventually got an amazing drummer called Darren Nolan and started playing at break neck speed which hurt our fingers. He said he would only stay for a short while but he stayed with us to the bitter end in 1991. After this we recorded an ep "I Really Do Love Penelope on 12". This was produced by Stan Erraught of the amazing Stars of Heaven . (All of their records have just been re-released on cd by Independent Records, go buy them you won't be disappointed). In 2005 we reformed for one night to play homage to the late great John Peel. It was our way of trying to thank him for all that he did for us as a band and also for filling our listening ears with amazing music. We can honestly say if it weren't for him there is no way people would still be interested in hearing our music, let alone release a compilation by us. Long may his memory live on. It was strange playing all together in the same room but it was alot of fun. Some people seemed to really like it and we even got a favourable gig review. It compared Darren's drumming skills to Keith Moon and the band to The Smiths, so we were quite chuffed. Eamonn wasn't impressed! You can buy the debut album 'Long Ball into Nowhere' and the 12 inch vinyl copies of 'I Really Do Love Penelope' directly from us.